I’ll be right up front with you, marketing is not my forte. But I’m a self-learner, and really, how hard could setting up a subscription form for my readers to join my newsletter be? Quite difficult, as it turns out. I’ve been attempting to build my mailing list for several months, as many of you know. I’m also doing it on a shoe-string budget (that means free.) Often I read everything I can find on how to do something, but this time I seemed to have absorbed just enough to make a mess. An email provider for newsletters was recommended to me and, what a delightful surprise…it was free! Their website was so simple it was difficult to navigate in. I guess that was the first indication that I needed things spelled out a bit more. I managed to create a Campaign for my first Newsletter, and imported a mailing list I’d been holding on to ever since my Art on Boston days (closed in 2010). I figured my patrons from those days might still be interested in my art and writing projects. After sending out my Newsletter, I received a notice that told me the email provider had eliminated all the emails of those who didn’t open, respond or otherwise hit a button to acknowledge my email. This immediately cut my patrons to approximately 25% of my original mailing list. This is OK, I thought, I don’t want to spam people who don’t want or need to know about my projects. At least I now knew who was interested. So I started a Campaign to build on these few remaining emails that basically represented immediate family and friends. I carefully read the email provider’s instructions for placing a sign-up form on my website. The provider generated a link that would take readers to a sign up page which would then add them to my mailing list. I added the link into my website, and voila! It was magic! I now had a tasteful, polite text phrase that directed readers to ‘click here’ to sign up for my mailing list. You don’t know how ecstatic this makes an overly right-brained, artistic type, non-technical person like me feel!!!! I then sent out pleas for emails. And got nothing. I offered a free gift to anyone signing up…and still seemed to be getting nothing. I then received an email from a wonderful reader who had read my book and wanted to sign up (she wasn’t even asking for the free gift!) and told me the sign up page was missing! Somehow, somewhere, at some time when I wasn’t looking, the link given to me by the email provider had changed! So the few individuals who wanted to sign up, couldn’t. Tip: ALWAYS test your website links as often as you can, and especially before sending out solicitations that invite your reader to visit your website and take action. They might be doing exactly what you ask them, but if the link is broken, you’ll never know! 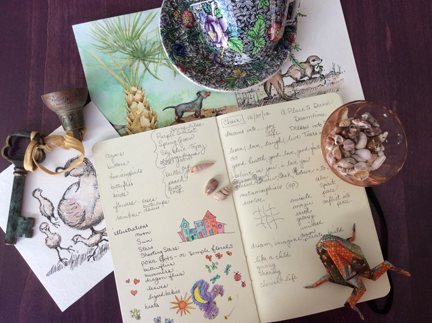 Click here to join my mailing list and receive My Six-Year-Old Inner Artist Newsletter. You will receive creative tips, news about upcoming publications, free gifts, and a chance to contribute to upcoming projects. If you’ve received a ‘page missing’ message when trying to sign up for my Six-Year-Old Inner Artist Newsletter on my website, WendyFallon.com, please try again, email me at wendy.w.fallon@gmail.com, or click on the link above. 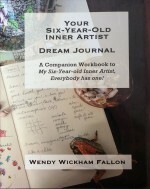 I have extended my offer of a FREE thank you gift, a PDF copy of Your Six-Year-Old Inner Artist Dream Journal, a Companion Workbook, through June 30, 2015, for joining my mailing list. By day I am a technical writer, and by night and on weekends I am an artist and creative writer. Having lived in Phoenix, AZ with my husband Tim for 23 years, I find the urban wilderness in which we lived to be endlessly fascinating. Our home was tucked up against South Mountain, the largest city park in the U.S. The canal slashing across the base of the mountain provides inspiration for paintings, drawings, and sitings of wild coyotes, skittering fluffs of newborn quail, lizards and constant change. This entry was posted in Artist, Mind, Web Technology. Bookmark the permalink. 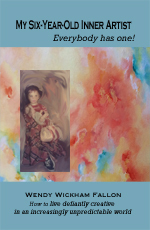 You can find additional articles about creativity by me on Ezinearticles.com.